John H. Steinborn was born in March 1854 in Wisconsin. He married Anna Marie (?) circa 1881. John H. Steinborn and Anna Marie (?) appeared in the US federal census of 1 June 1900 in Butte, Silver Bow County, Montana, at 628 South Jackson Street. Other members of the household included Frank Doull and Clara M. Steinborn. He was mining ore, according to the 1900 census. John H. Steinborn and Anna Marie (?) appeared in the US federal census of 15 April 1910 in Butte, Montana, at 628 South Jackson Street and boarder Lillian Held.. Other members of the household included Clara M. Steinborn. He was a city policeman, according to the 1910 census. 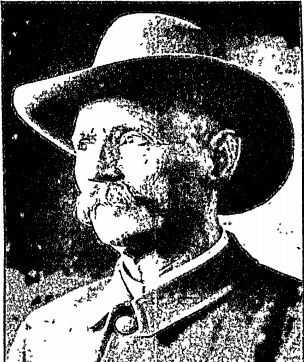 The following appeared on 24 August 1919 in The Anaconda Standard, in the "Builders of Butte" series: In a service of practically 26 years, with a little interruption due to political causes over which he had no control, no man now or ever connected with the police force of Butte has been thrown in close contact with more of the big events that form part of the history of the city than has Patrolman John H. Steinborn. . . . /P/ John Steinborn has been a resident of the mining sections of the West for 45 years. He went to Nevada in 1875, from Racine, Wis., his native town. He put in 14 years in Nevada and Washington, working at mining, and came to Butte in 1889. In April, 1893, Mayor Dugan appointed him to the police force. That was more than 26 years ago now. In those days the mayor made the appointments without asking any one, and with no formality except the approval of the city council. He was dropped from the force when Mayor McCarthy took office, but came back under Mayor Davey, and has been on ever since. He is the longest in point of service on the police force, and he is still going good. John H. Steinborn and Anna Marie (?) appeared in the US federal census of 1 January 1920 in Butte, Montana, at 628 South Jackson Street. He was an officer on the police force, according to the 1920 census. Anna Marie (?) became a widow at his death. John H. Steinborn died on 18 March 1925 in Montana.